Doll's Musings: Magic Garden Finish and Samplers Galore! Magic Garden Finish and Samplers Galore! Welcome to my new followers! Thank you all for your lovely comments on my last post. I'm behind in emails since I've had a load of stress heaped onto my plate this week. Both in life and in work. Just a lot of decisions and different paths to ponder makes for a dizzy head. One really wonderful event happened at work on Thursday; a designation for a sweet, dear boy close to my heart came through which means he will get some aid time for next year! I literally cried when I heard the news! The poor Grade 7 boy working on his math who had to witness my exclamation, looked concerned for me. I told him not to worry, the tears are happy tears. A very bright light in a week of changes. On Friday night, I added the last stitches in Magic Garden. It was a really fun design to stitch and I'm happy to pass it along to someone if they would like it. I know dear Maggee is still working on hers so don't forget to cheer her on...like I will! Details: Stitched on 40 ct. Vintage Exemplar Linen with GAST recommended threads. Now I have three samplers on the go! This weekend I forged ahead on all three of them. I finished the border for the BBD SAL which I know starts today, but since I work all week I thought it would be smart to get a head start. Added a wee bit of progress on both JCS and Sarah. As we say in the stitching world, progress is progress!! 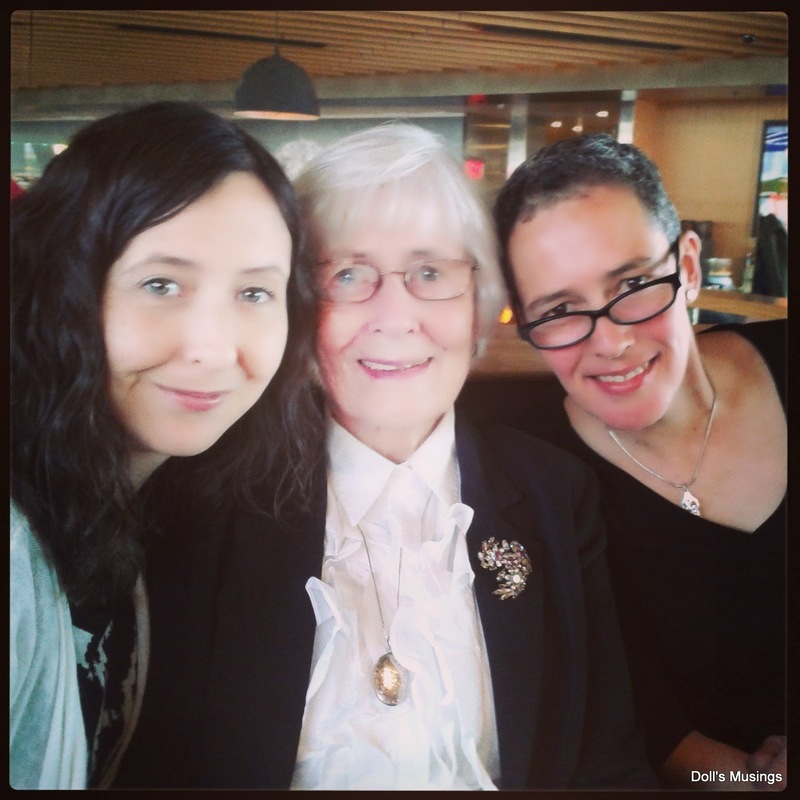 Yesterday was Mother's Day and my aunts and I took Nana out for a lovely brunch by Coal Harbor. The day was gorgeous and the food delicious. We had a wonderful day together. Happy Mother's Day to all of you! I just wish my mom could have been with us as well! My Nana is an amazing woman and she has a tendency to proclaim to people how old she is, and it's always a year older than her real age. She was saying she's "85!" but really, she's 84. She's always done this, hence my confusion with what her real age is! Love you Nana!! We are very much alike in our personalities and cheek bones! Granny Stripe Progress: 2 more stripes! Yay! I loved working with the last colour: lipstick red. It is very bright and cheery. 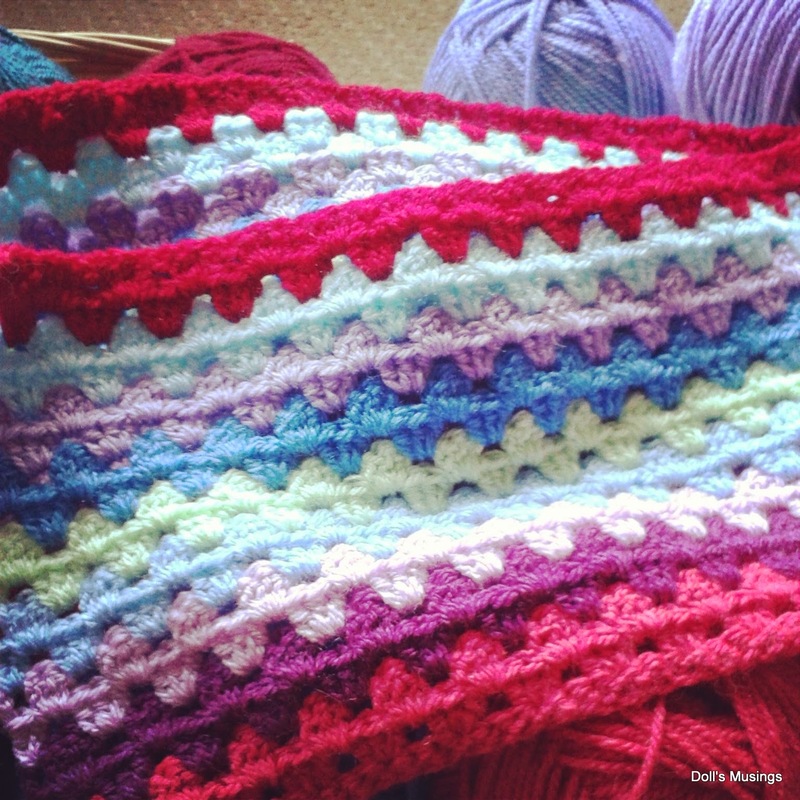 I was perusing Attic24's blog the other day and noticed the mandala frenzy that is going on in the crochet world. Some really amazing mandalas out there that I think I'm going to start one myself. I just need to find some bright coloured cotton yarns. Borrowed from Attic24's blog..isn't this brilliant?! The last picture is from Zooty Owl's blog. Check out her great tutorial for making mandalas! Today, my husband and I went into the last antique store on Antique Alley in New Westminster. We chatted with the old, darling lady there about all sorts of things. I found so many items I wanted but could not get at the time. But I had to purchase this!! 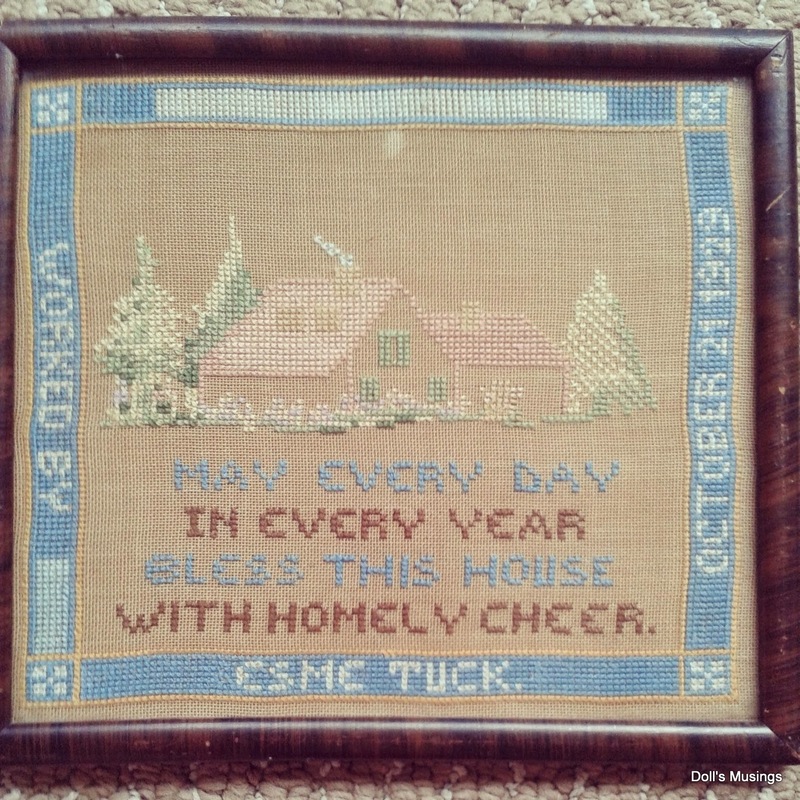 My very first antique cross stitching piece by Esme Tuck, stitched in 1929! Pre-World war II!! I NEVER come across anything like this in all my times I've spent in thrift and antique stores. I think this is so sweet and the price was right at $40. Before we left, my husband picked up the teeniest little old leather-bound books on the counter. Uh oh....BOOKS...and small old ones to boot. I picked one up and it was Turgenev! A book I've never read yet of his but will soon read!! It was only $5 so how could I pass it up?! What a great day! I hope to catch up with you all soon! Here's a photo of Titus since some of you were wondering where he was in the past few posts. The magic garden finish is just great, it's a very appealing design. 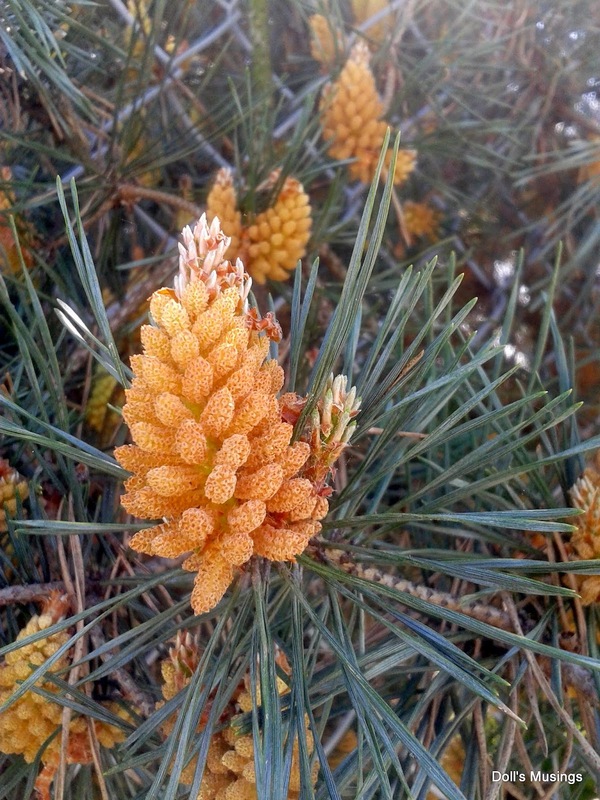 Lovely mixed post, it's always fun to stop by and catch up with your blog Anne. Magic Garden is a super finish. Such a lovely pic of nana and her family have a lovely time together. 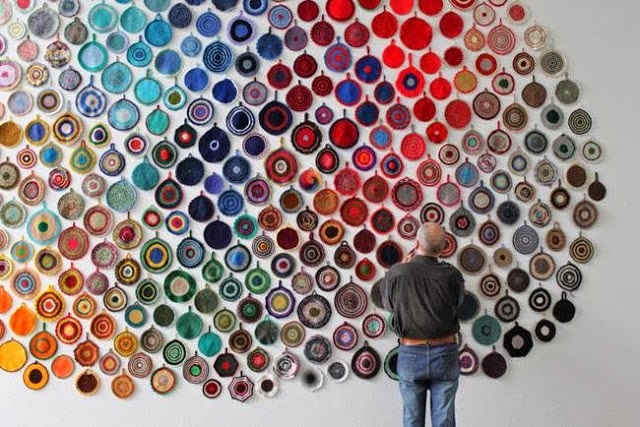 WOW ... gorgeous mandalas, although the colours on your crochet blanket are gorgeous too. Titus is such a sweetie, furry cat cuddles to him. Good news your student is getting the help they deserve. Titus looks quite coy in that photo. What a flirt! I hope that the stress leaves soon. I am glad that you are getting some stitches in. Congrats on the Magic Garden piece, I have loved watching this piece grow. All of your samplers are looking great too. Those mandalas are beautiful, love the colors.I can't wait to see what you come up with. What a wonderful post! Love your finished sampler its lovely... I really like it. So many lovely things on your post today... I LOVE IT ALL!!! What a lovely post with all your progress. Congrats on the completion of your mystery garden. The design intrigues more and more as I see folks posting theirs. What joyous news for your 7th grader...hoping that brings a reprieve to your stress. Your granny stripe is so cheery and delightful with the colors you've chosen. Have a terrific day. I wish every student was as lucky to have such a kind, caring teacher as you, Anne... I'm so glad he'll be getting the extra help--it may make all the difference in his life. Your finish is so pretty--I just love all the details in it and it's perfect for this time of year. And what a pretty new sampler with all the pink! Such beautiful and inspirational colors and I love that you found a small old book--perfect!! I hope your week calms down--I'm sure you're ready for a summer vacation :) Sending a big hug your way! I hope all the stress and decisions and all gets settled and you can relax more. I'm glad there was a happy moment at work at least. Love your garden finish -- so so pretty! Love all your stitching and crochet too. Beautiful! You and your Nana and Aunt -- the family resemblance is quite striking! I wanted to say that on IG and now I can say it here instead. lol! 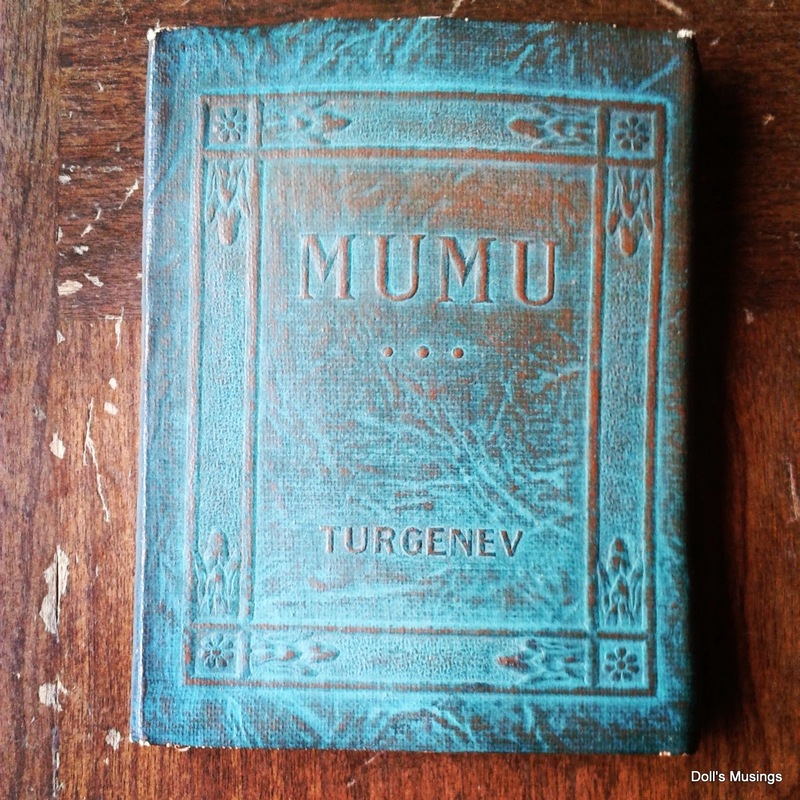 Love your antique find, and the beautiful small book too! You have to report on how the novel is. Never read that one either. Hi Anne, So sorry to hear about the stress in your life, but at least your student got some aid. Magic Garden is gorgeous! I have loved that piece since the first time I saw it. If you are putting names into a hat for it, please include mine! Only three samplers on the go? (smile) Your crochet looks great, and I love the mandala idea. Three good-looking women in your Mother's Day photo, and Titus is debonair as always! What a lovely lady who doesn't look anywhere near her age! Your stitchery looks great, I LOVE that book, and Titus obviously knows how to strike a pose. Such a great picture of you, your Aunt and Nana. I am praying for you two. Your new sampler is great. The Granny Stripe keeps getting better and better. I love antique stores. 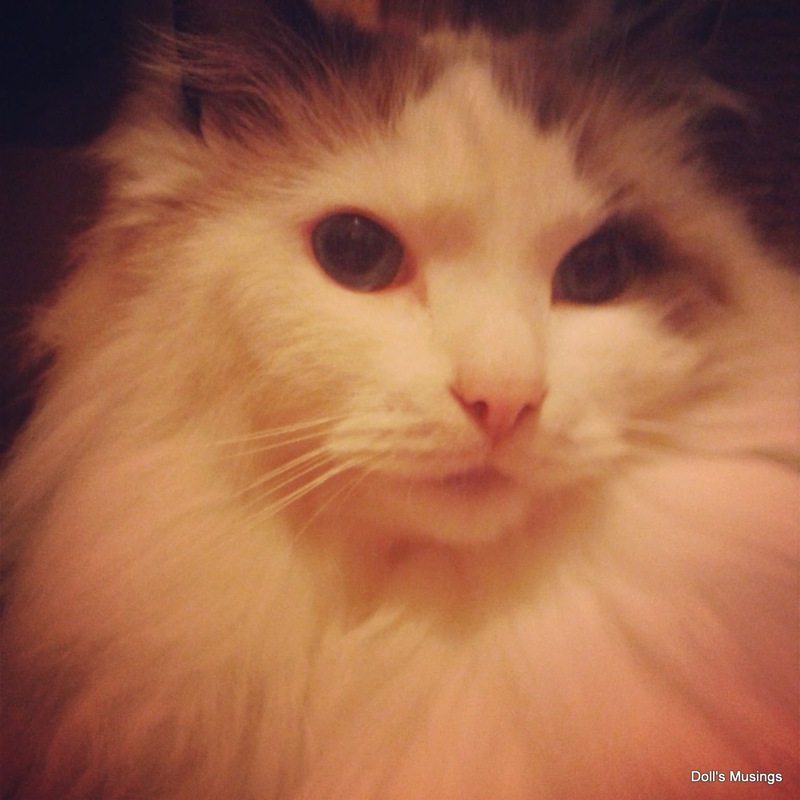 Ahhh, Mr Titus - I think he really knows how to glam it up for the camera! That is a gorgeous photo of him! Love all the stitching. Congrats on the Magic Garden finish! Great finds from you antique store too. What a lovely photo of you, your Nana and your aunt. It was a gorgeous day for Mother's Day, wasn't it? ps So happy that you got that boy the designation. Good work, Mrs Doll! Congrats on finishing Magic Garden! It's beautiful. Your progress on the samplers is coming along great. Congrats too on the great antique find! :D I never find anything that special either. Have you found a spot to hang it? The magic garden finish is just great and all of your samplers are looking great too. I would love to stitch the Magic Garden.... my sweet guy gives me a real life garden of delight. This would be a perfect pillow front for us. 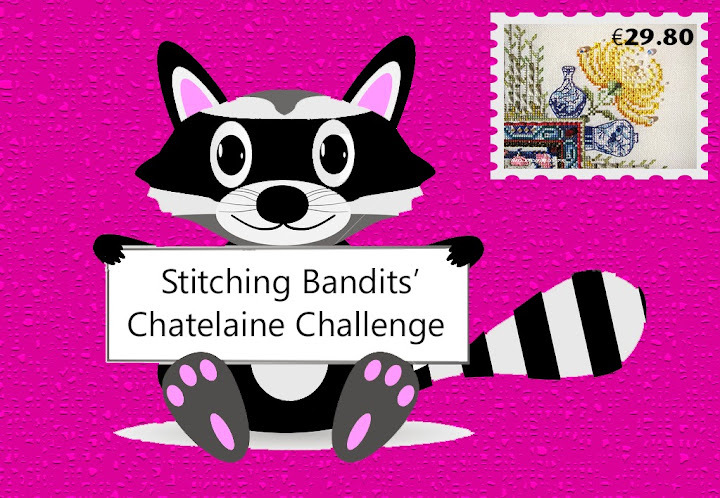 Beautiful stitching - and what a GREAT find~~ you are one lucky girl. Congrats on the pretty finish Anne. Nice progress on the samplers. Love the pic of Titus. Magic Garden is just beautiful. I love that design. Great color choices for BBD. A simple schoolgirl ABC sampler can be fun occasionally. How cool to find that old sampler in what appears to be good condition. A little piece of history and a treasure of a book at the same time! Lucky you! I love the way Magic Garden turned out! What a nice picture of you and your family. So glad you had a good Mother's Day and I'm sure you made it a happy one for your Nana. I had to laugh at your Nana's age story. My 85-year-old father does the same, except he always says that he's in his 86th year. He is right! All your stitching is lovely. Thanks for sharing! Beautiful post , lovely samplers. I think I am a bit like your Nana I always say I am older than I am . Must be a age thing ha . Your blanket is looking beautiful such pretty colours. Magic Garden is absolutely gorgeous,congratulations on your finish. Your job I can imagine has is awesomely times.. but also sad times!! Congratz on your finish, it looks great!! What your going to do with it?? What a awesome beautifull pictiure with your Nana!! Your granny stripe looks so awesome!! Every time I see it, My fingers wanne finish mine!! You bought some great things!! ow what a cute pic of your cat!! have a great week, hope a good week, with only fun and happy things! Beautiful Magic Garden finish and love your O Birdie finish from your last post too. You've been making great progress on your pieces. I'll be watching for your start on the BBD piece, Buttercream is one of my favorite colors of lines, it's just so cozy in feeling, and the floss-toss looks good. You have to at least do a little research to find out about Esme Tuck for your antique purchase! It would be great to have a story to go with it! I have not completed my piece yet...sad to say...LOTS happening to slow me down on stitching (will email later). Tracy Horner of Ink Circles designs mandalas--they are beautiful. I have a big coloring book of mandalas that me and the grands get into... Great progress on all your projects. Your family all bear a striking resemblance to each other--especially the cheekbones! Beautiful! Hugs! Sorry to hear about all of the stress. I hope things will calm down soon. Magic Garden looks wonderful. Your other WIPs are coming along nicely too. A beautiful photo of you, your Nana and Aunt. She certainly doesn't look 84/85! What beautiful antique buys. It would be fun to find out more about Esme. My friend has just named her baby Esme. It must be making a comeback! Magic Garden is lovely but I have enough on my list for now!! And my Nana always added a year on to her age "I'll be 83 this year" but even worse she did it to me too!! "This is my grand-daughter, she'll be 32 next year, won't you?" "No, Nana, I'm only 30 now" "But you'll be 31 this year and 32 next year. How old will your sister be when you're 32?" and so on. Lovely stitching as usual Anne :) You are so right Progress is Progress lol. I think that will have to be my motto. 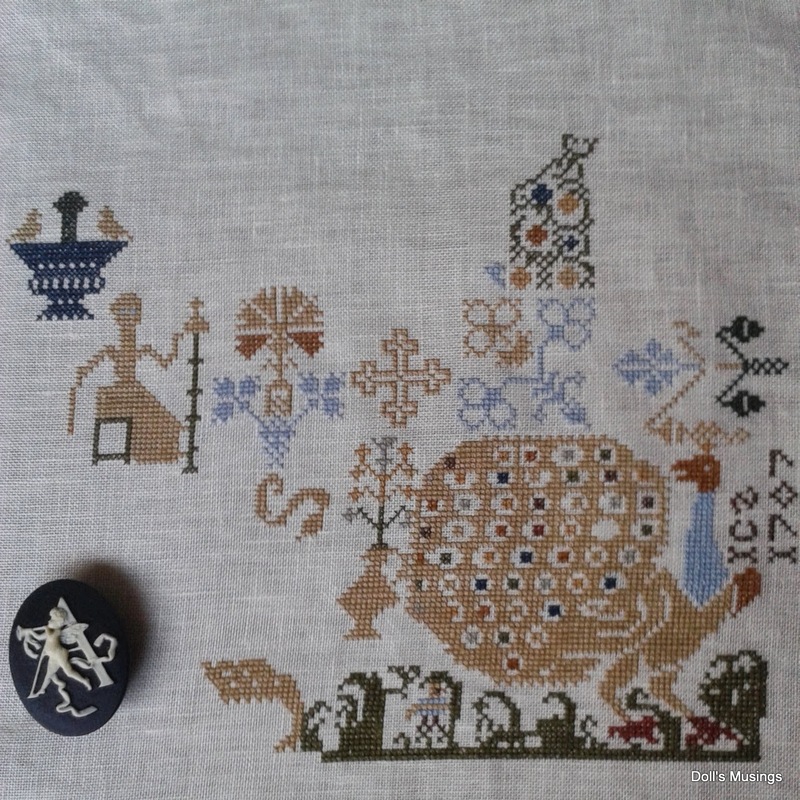 I think the antique x-stitch you rescued is beautiful! Can't believe it's from 1929! Amazing! Happy long weekend! May LOTS of stitching get done hehe. I hope all the stress calms down soon, glad to hear you've been able to get your student the help he needs. 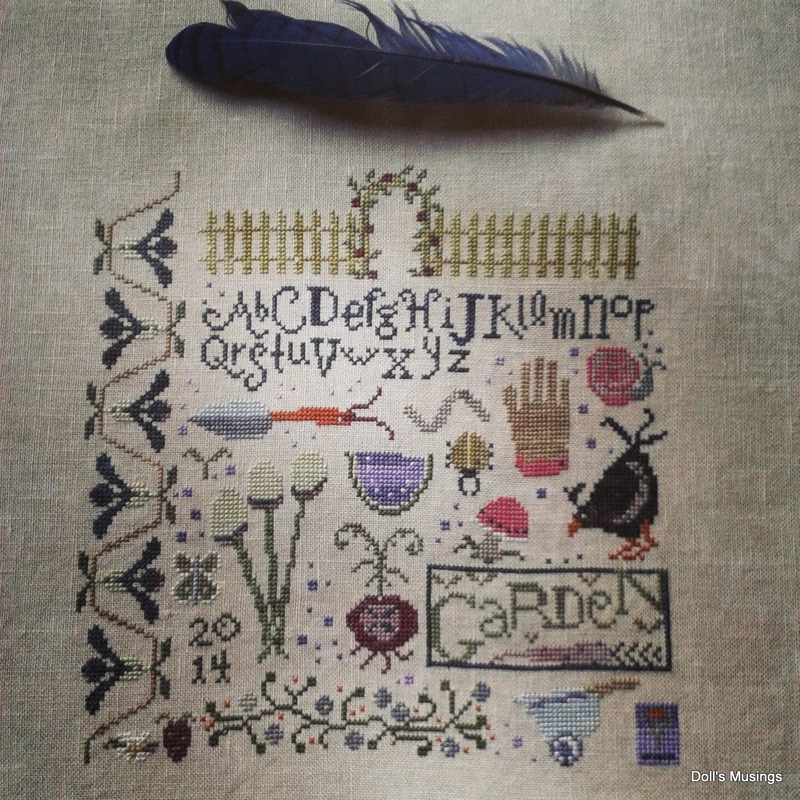 Congratulations on finishing your garden, it's gorgeous and your other samplers look lovely. I hope for you that the stressful time is over and you have settled down for a quieter week and weekend. What a wonderful day you could spend with your nana. It's amazing to see her picture and to know that she's 84. So sad that your mom couldn't be with you and celebrate the day with you. Congratulations on the wonderful finish. And wow, each of your samplers has seen some progress. 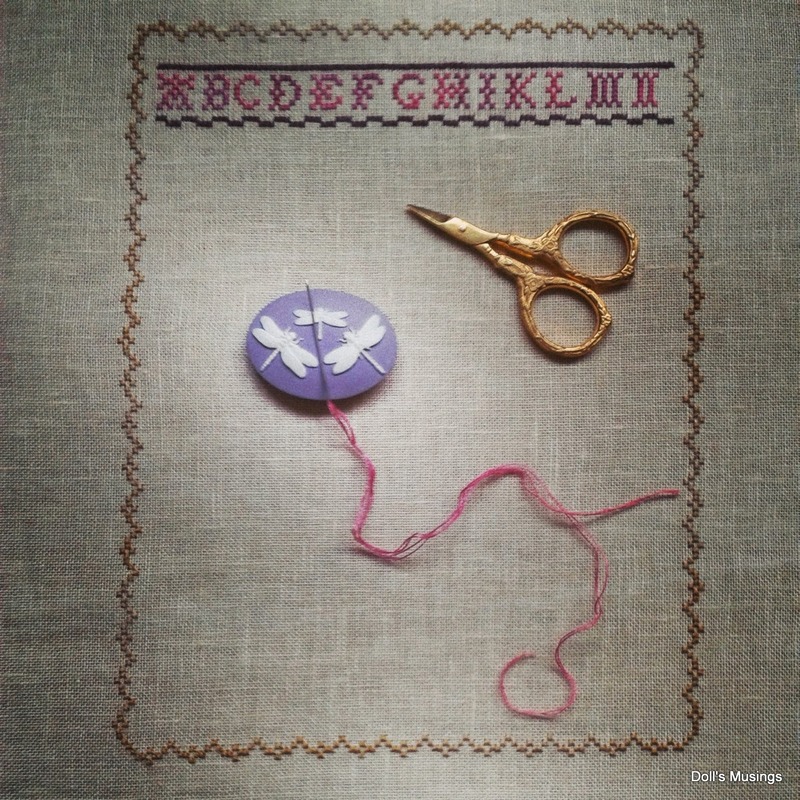 You are so right - every stitch is a progress and brings you nearer to a finish. Congratulations on your finish...I love the colors on that one. Both of your WIPs are coming along really well, too! Awesome photo of Nana. :) My Dad does the same thing with age... only he does it with us kids. He always says we're a year older than we really are. Has done that forever! Congrats on your finish! It's adorable.